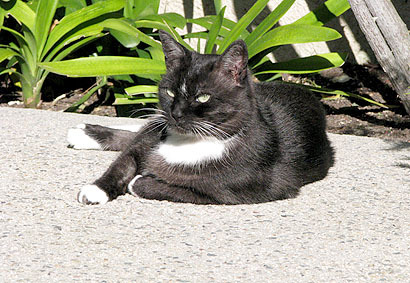 Yesterday was just a beautiful day here in Southern California, so the cats were out playing in the garden. 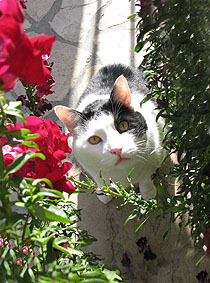 Inkblot was sniffing around the flowers, occasionally looking up to ask why someone kept pointing a giant glass eye in his direction. Domino sat serenely with the sun hitting her directly enough that you can actually see her face in this picture, not just a furry black blob. And today? It’s looking just as good. Have a nice weekend, everyone.